The best way to ensure a successful transition from the law is to have a plan – and the sooner you start planning, the better. For retirement, experts say planning should be well underway by age 60. But don’t panic if you’re not quite there. A transition plan is critical. It is a roadmap for your exit strategy. It will guide your decision-making along the way. A good plan establishes measurable goals and specific deadlines. You can monitor your progress at regular intervals – every 90 days or six months, for example. And a good plan will be flexible enough for the inevitable curve balls that will come your way. For North Carolina lawyers, a good place to start is the NC Bar Association’s Transitioning Lawyers Commission. There you will find a wealth of resources. You can even request a consultation with an expert to talk you through important issues. Time and money resources. How will you maintain your lifestyle when you retire? How will you provide for yourself and your family? How much should you be saving now? What type of pension or retirement accounts would work best? Health. People who practice healthy habits live longer, have higher cognitive abilities, fewer medical issues and greater independence. Start building those habits now. Relationships and loved ones. When you make a professional transition, your relationships will change. Perhaps you will be spending more time at home. Or your free time might lead to new activities and friendships. Put your priorities down in writing. Vocation. Do you plan to continue working part-time? In the law or in a less stressful field? Maybe you’ve always dreamed of teaching. Or perhaps you’d love to try something completely different. Now is the time to go for it. Begin now. Even new attorneys can start envisioning their ideal life after the law. This vision will help keep you on track and avoid distracting detours. Contact the NCBA. 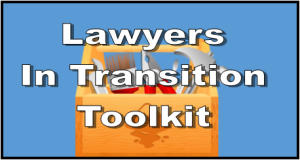 The Transitioning Lawyers Commission can help guide you through this phase of your journey. Follow the AARP’s 10-Step Plan. This helpful template covers all your basic planning needs. Keep it positive. Have fun with your transition plan. See it as an adventure, a treasure map, the next chapter in your memoir!